Our aim is simple, get more people on more bikes in a more affordable way, whilst offering education and training to keep you and your bike on the move. We will help find the right second hand bike for you – one that suits your needs, sizing and just as importantly, your budget. Prices start around £70 for an adults bike, with kids bikes starting from £10! All bikes have been checked by our qualified mechanics, passing industry standardised tests. For peace of mind, every bike we sell comes with a 2 month warranty. Any tweaks can be sorted and many Ride On bikes now come back to our workshop with their new owners just to say hello, also to use our bike stands, tools and friendly mechanics to do their own maintenance. WHY NOT do your own bike maintenance on Wednesdays with the help of one of our mechanics at the Bring Your Own Bike sessions or sign up for one of our very well received Saturdays for more in depth knowledge – see our Maintenance Course page! We do our best to refurbish a variety of second hand donated bikes but the only way to find out what we have is to come down and see what is currently in stock as it is continually changing. come down and take a test ride, its the only way to get the right bike for YOU. When you buy from us, you will be supporting a local charity, diverting all sorts of mixed waste from landfill and getting yourself a quality bike, sound advice and friendly service. 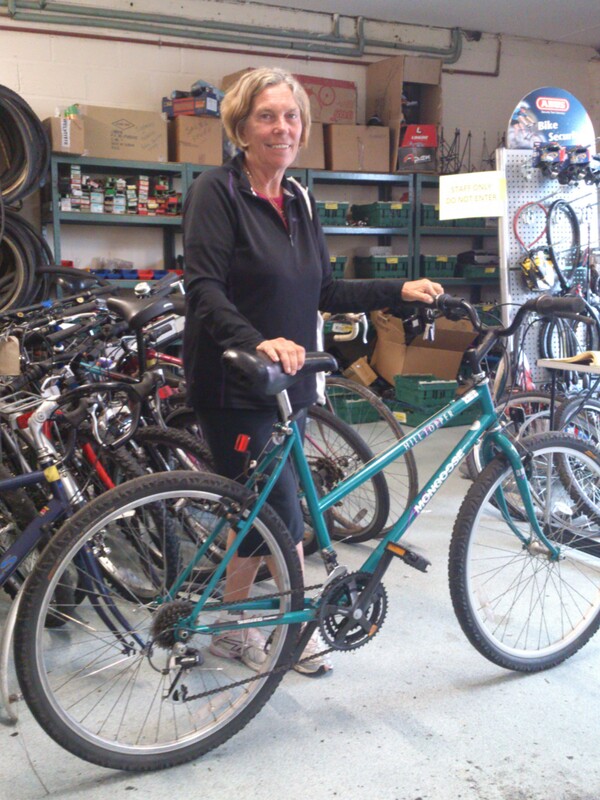 Run entirely by bike-loving, knowledgeable volunteers, we meet regularly to work on bikes – if you are interested in buying a second-hand bike or getting involved, please Contact Us. A huge thank you to the guys at Ride On. I had an issue with riding my tricycle, where a normal pedal did not suit my needs. Mike designed me a solution, and created a prototype to test. He even cycled with me to check that it was suitable. A really dynamic solution makes the biggest change – and I will be back soon as the team were keen to look at a few alternative approaches. Whilst I was there they even checked my tricycle brakes and made sure I was safe to Ride On home! 🙂 The whole gang were really friendly and welcoming, even offered me a cup of tea! I hope they realize how happy they have made me, and how amazing the work that they do is! Thank you so much! !